This make affords students the opportunity to think outside “doing school” and access the creative sides of the brain while still engaging in critical thinking, reflection, and processing abstract concepts. The example here is for Eastern Philosophy, but it is readily adaptable. The central make is an Altered Book, taking a book destined for the trash heap and remixing it to become an art piece connected to a literary question. There are a number of sites and videos for instruction on the techniques used. The key element in this make is to use the artistic process to consider the literature in a new way. 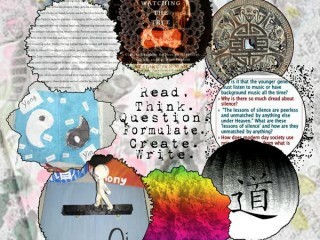 When the altered books are complete and shared, then students will be more inclined to write more deeply. In the many years I have done this particular project, students (even the “non-artists”) typically remember this one as one they liked best. This work by Stephanie Loomis is licensed under a Creative Commons Attribution-ShareAlike 4.0 International License.